After working with more than 100 students over the past 15 years, you might think Roberta Thomas, LCSW, would be a bit tired of being a field instructor. 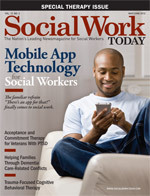 The potential for a similar experience draws many social workers to field instruction; there’s the chance to give back to the profession, shape the development of new social workers, and build supervisory skills. But field instruction is not for everyone, and a social worker’s failure to seriously self-assess his or her abilities and limitations as a field instructor can lead to bad experiences for students. • Know the requirements. Schools of social work have eligibility requirements for field instructors, and these requirements vary among institutions. For example, schools may require a certain number of years of post-MSW experience or accept only licensed social workers. New field instructors also may be required to attend field instruction workshops or classes. • Be realistic about expectations. Field instruction takes a serious investment in time, typically at least one or two hours per week in supervision with students plus additional time for providing feedback on student assignments, preparing evaluations, and attending meetings with field education staff. Successful field instruction also requires providing meaningful assignments and opportunities to students instead of seeing them simply as cheap or free labor, says Maribel Quiala, LCSW, director of clinical services at Fort Lauderdale Hospital in Florida. “The interns are not our indentured servants; they’re our colleagues,” she says. • Teach and be willing to learn. Field instructors are supervisors but equally, if not more, important is their role as teachers, says Kanako Okuda, MSW, LCSW, assistant director of field education at the Silberman School of Social Work at Hunter College in New York. This role as teacher includes helping students connect classroom knowledge with real-world experience and using student mistakes as learning opportunities. But students also can suffer if there is a lack of structure and clear communication about expectations and boundaries. Field instructors need to be careful to not let students get too dependent on them and find a happy medium between the extremes of being a student’s best friend and being a strict authoritarian figure, says Trudy Zimmerman, assistant dean for field education at the Boston University School of Social Work. • Seek out agency support. Time spent working with students not only requires a sacrifice on the part of field instructors but one from their agencies as well. Field instructors who work for agencies that won’t or can’t give them enough time or other resources for supervision run the risk of not being able to give students proper attention—and leaving the students disillusioned, Zimmerman says. Field instructors also need to be ready to step in to protect students from agency politics that detract from students’ learning experiences, says Joy Rubin, MSW, interim director of field education at California State University, Long Beach. • Be creative. Just because you work for a small agency or one that focuses on a single population doesn’t mean you can’t provide a rich variety of field instruction experiences to students, Quiala says. Think about new ways to give students real-world experience in a plethora of areas of social work practice and consider how you can weave into supervision sessions topics or concepts that aren’t in the agency’s scope of operations—policy advocacy, for example. • Be positive yet honest about social work. It’s common for people to complain about their jobs from time to time, but field instructors must understand how excessive negativity about their work or their colleagues affects students’ perceptions of the profession. Field instructors with positive attitudes and a passion for what they are doing can make students’ learning experiences fabulous, Thomas says. That need for honesty presents what field instructors and educators agree is one of the biggest challenges field instructors face: what to do when a student—for ethical, psychological, or other reasons—does not seem well suited for the social work profession. It’s important to establish a clear process to follow when a troublesome student situation arises, Thomas says. For example, a field instructor may start by addressing his or her concerns with the student and creating an action plan to address those concerns. If this doesn’t work, then field education staff can be brought into the discussion to take corrective action, find a more appropriate placement for the student, or help ease the student out of a social work program.